Before you pick up the rented tub it is necessary that you print out and sign the Rental Agreement. To insure the rental of the tub, you must pay a $175 non-refundable deposit. Thanks for supporting the work! Look below for video, photos and details of the tub. ONLY rentable in the New York City area. If you are interested and would like further information or conversation about this tub, please call: 212-222-4349. 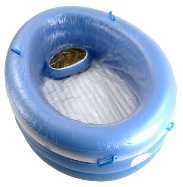 Eco-friendly, PVC inflatable pool, Birth Pool in a Box is the only FDA approved inflatable waterbirth tub. Made of non’-toxic material without banned phthalate chemicals. The Birth Pool in a Box includes a seat, and has been designed for strength and comfort. The unique design provides room for both the laboring mom and a support person. The double-reinforced handles located in three different locations allows birthing and laboring mothers to be comfortable and safe while in the pool. Developed for personal and home use, it is both economical as well as eco friendly and extremely easy to set up and use.